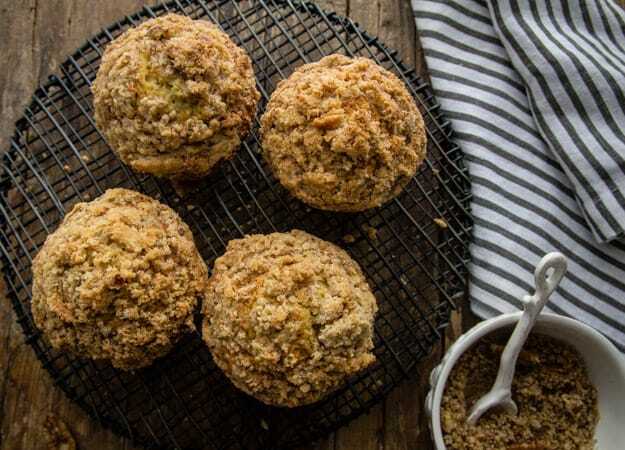 Pecan Banana Crumb Muffins, 2 bananas make this Banana Crumb Muffin Recipe so tasty and moist and the crunchy Pecan Crumb Topping makes them the Best. 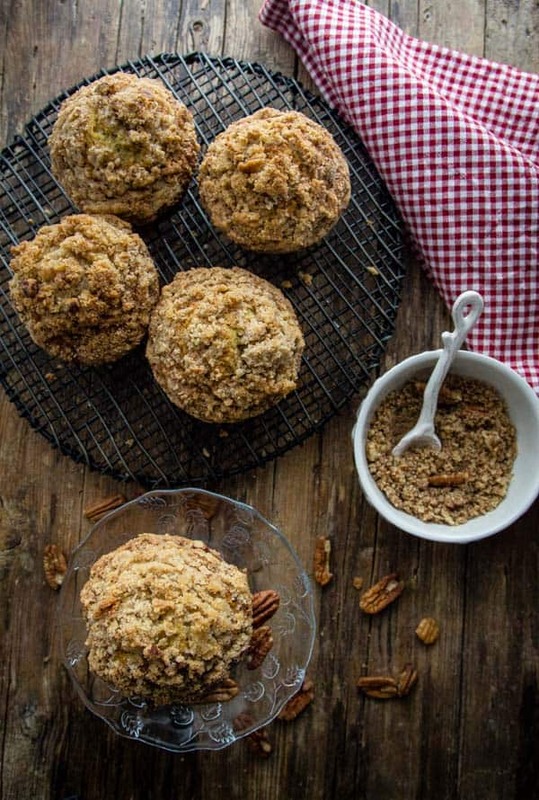 Pecan Banana Crumb Muffins, my new favourite muffin! They go so quick I have to double the recipe. 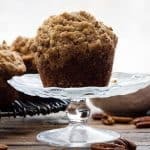 I love muffins, they are so quick and easy to put together, from Big Double Chocolate Chip to Orange Streusel to even Blueberry Chocolate Chip. But one thing is for sure, I like Big Muffins. So needless to say I am always on the lookout for a good one. The last few mornings as I glanced at the fruit bowl and saw two very ripe bananas just sitting there, I knew it wouldn’t take the Italian long to give me a hint that baking up my Banana Cake may be a good idea. To tell the truth I wanted to try something else, I am pretty well Banana Caked out. As I was reading one of my favourite Food Blogger’s Blogs, and in all honesty I only read a handful. My daughter of Course, What Erika Wears, a couple of others and a woman who has become a good friend, April, from Girl Gone Gourmet. I love how she writes, she shares herself and her life so perfectly and needless to say her recipes are pretty awesome too! 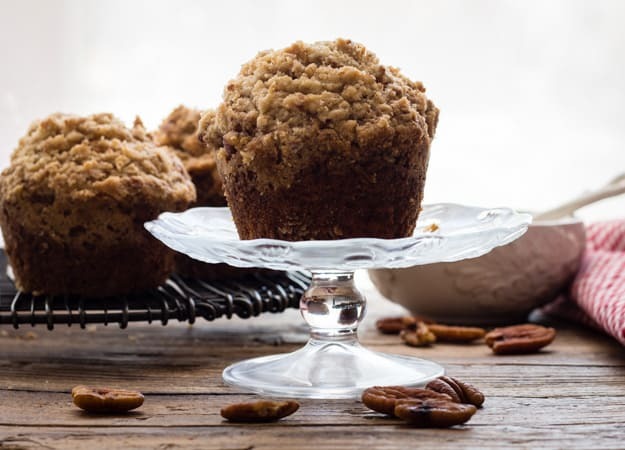 So when she posted a recipe for Peanut Butter Banana Bread and I saw these Banana Nut Muffins, I knew where those 2 bananas of mine were going to end up! Hello Muffins, although the Banana Bread sounded really good too. The funny thing, here in Italy you can’t find walnuts until Christmas, so I thought Pecans. I had a bag in the freezer. My daughter who is not a nut fan, requested “no nuts, please”, so I decided those Pecans would make the best Crumble Topping, and they did. And guess who didn’t even notice, yes the same one who eats the Streusel off all the muffins if you don’t catch her in time. I’m telling you, these are definitely the muffin to try, big (or medium if you prefer), moist and that Pecan Crunchy Topping is to die for. Enjoy! And Happy Weekend. 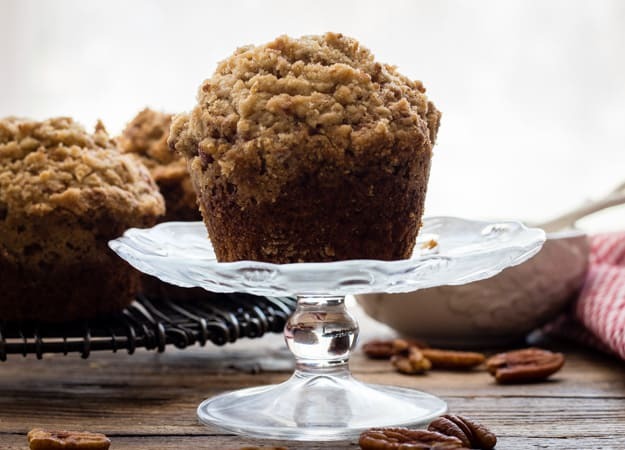 Pecan Banana Crumb Muffins, the easiest and best Banana Muffins with a crunchy yummy Pecan Streusel Topping. Breakfast just got better! Pre-heat oven to 350°F (180°C), grease and flour a large or medium sized muffin tin. In a large bowl mix together with a wooden spoon, mashed bananas, melted butter, egg, sugar and vanilla, until well combined. Spoon into prepared muffins cups (a little more than 3/4 full), top with streusel topping. Bake for approximately 20-35 minutes (depending on the size of the muffin tin), check for doneness with a tooth pick. Let cool. Enjoy. In a small bowl mix together with a fork brown sugar and flour then cut in cold butter and combine with a pastry blender until it resembles the size of peas. Stir in chopped Pecans. **I got 5 large muffins so I assume you could get 10 medium. Where are you finding pecans in Italy. I know you are in the north and I am in the south but pecans are no existent here in Sicily. Plus what brown sugar do you use. I have it brought over from the states because well, brown sugar in Sicily isn’t really brown sugar – either really grainy or molasses. I have 10 more months of baking in Italy and would appreciate the suggestions.